We both really enjoyed the taste. It isn’t as tangy as regular Greek Yogurt- which E isn’t a huge fan of. I mixed the regular Oikos Greek chocolate yogurt with the YoKids Greek to make our delicious ice pops last week. They were soooo delicious! You can even freeze the multipacks and put them in your child’s lunch box. They should be thawed by lunch time! Speaking of multipack cups, did you know that all of the YoKids multipacks are made out of plants? The YoKids site says, “Plant your seeds in yogurt cup and do as the Lorax says. ‘Give it clean water. Give it fresh air.’ Soon enough you’ll have a plant in a cup made from plants!” How cool is that? We will so be trying this!! Stonyfield has teamed up with the new Dr. Suess’ The Lorax movie and has some fun games, activities, and learning tools on their website. Be sure to stop by and play for a chance to win a personal screening of Dr. Suess’s The Lorax and a organic garden for your child’s school! 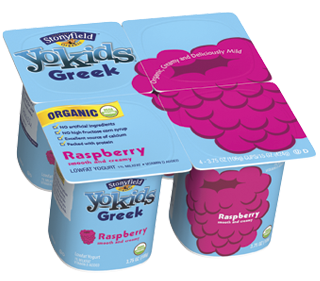 And stop by the YoKids Facebook page to win one of four grand prizes ranging from a year’s worth of free YoKids yogurt to $2,000 in organic groceries.